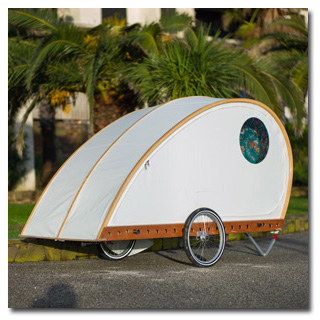 If it's going to work in the real world, a bicycle caravan needs to be small enough to stow and be transported easily and yet big enough for real comfort. Yet it mustn't be too big or you won't be able to get anywhere with it. It would also be nice if it was cheap to build, was aerodynamic and light so it was easy to tow. And wouldn't it be great if you could fit in a sailing dinghy and take that camping as well. Well you may not believe this but the Foldavan does all this and more. 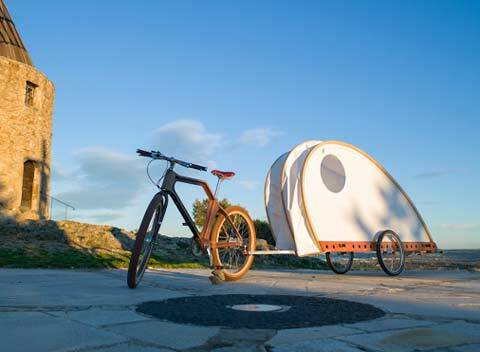 Not everyone is going to start their biking holiday from their home base so it is imperative that the Foldavan can pack away small enough so it can be easily carried to another destination. 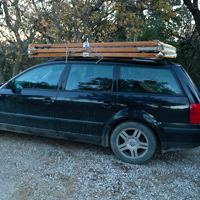 The Foldavan compresses to just 210 mm wide and will fit on most car roof racks. Another advantage of this narrow 'Stow Mode' is that your Foldavan can be safely stowed away somewhere indoors without it getting in the way when you're not using it. On the road, the Foldavan opens to 60 cm. This is about the same as the width of most handlebars. If you can pass with your bicycle you can probably pass with the Foldavan. It has a low centre of gravity so it is able to negotiate even quite rough terrain (especially when laden) If it is windy you can unzip the sides to let the wind pass through and stop it from getting blown over. 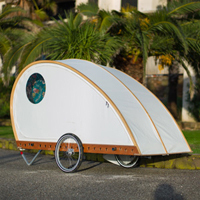 With a trailer you can carry a lot more stuff than if you only had a bicycle. This increases your comfort levels. When you arrive at your chosen camp site it takes less than five minutes to put the Foldavan in 'Camping Mode', a full metre wide and over a metre of headroom. The thick mattress is in two pieces and ensures extreme comfort and jealous looks from your neighbours. You can camp in places where you wouldn't be able to pitch a tent. You don't have to worry about stones poking you in the back, rough or sloping terrain, insects, damp ground, sudden rain etc. 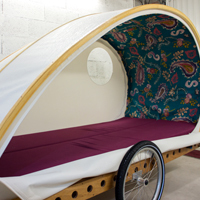 If you would like a slightly wider version you can even build a Foldavan to be a wopping 1.2 metres wide. The concise illustrated plans cost just £30 and contain a wealth of information for the first time builder or the experienced alike. Lots of advice on where to find the materials you need. How to work with tools, advice on alternative building options, how to finish your Foldavan and lots more. Even if you've never made anything like this in your life, if you are prepared to have a go and have a few basic tools you can build yourself a Foldavan and personalise it in any way you like. You could change the fabric, cover it in a camouflage fabric and use it as a hide or just to blend in to nature better. You could have a pink one or have zebra stripes. You could do you own paint job on it. The choices are almost endless. The materials needed to build a Foldavan are all easy to find almost anywhere in the world in varying qualities to suit your budget. You could make a Foldavan for next to nothing using reclaimed timber and secondhand parts. It takes about 50 hours to build a Foldavan. The Carbon Footprint of a Foldavan is small because all the materials are easy to find and can be sourced locally. As if this wasn't already fantastic enough Woodenwidget will plant 5 trees on your behalf when you buy plans. 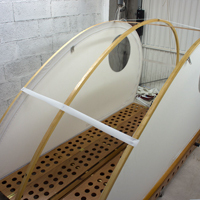 And if you buy the Foldavan/dinghy combo deal you save £10 and we will plant ten trees on your behalf. Plans can be bought on line and downloaded in a matter or minutes. Q: How long will it take to build my Foldavan? Much will depend on your skills and workspace but expect about 50 hours to build. What takes the most time is the varnishing or painting, the actual structure is pretty quick to build. Q: How much will a Foldavan cost to build? It is impossible to say. There are so many variables but it could be possible to build a Foldavan for almost nothing if you use reclaimed timber and found parts or you can spend a fortune and buy everything in. Q: Do you sell a Foldavan kit? Sorry no, the Foldavan is only available in plan form. But don't let this stop you! All you need is a jigsaw, a plane and a few other tools and you can soon build one. It's great fun. Q: Isn't the skin easily damaged? Woodenwidget recommend a reinforced PVC cloth for the Foldavan as it is waterproof, non stretchy and very tough. Looked after PVC has a very long life span. It is very unlikely that during normal use you would damage it. And even if you did it is easily repaired. Of course if you are worried about the skin being damaged you can use a heavier cloth but naturally this will make the Foldavan heavier. The design allows for the use of almost any non sretchy fabric. Q: What is the Foldavan's carrying capacity? The Foldavan can obviously serve as a covered trailer and has been tested by carrying 75 kilos in addition to the weight of the Foldavan. There are three modes and it takes a few minutes to pass from mode to mode. So if you were in 'Road' mode and arrived at the camp site it would take you less than 5 minutes to set up and that includes fitting the headlining and mattresses etc. Q: What happens if it's windy when I am towing? You have two options. 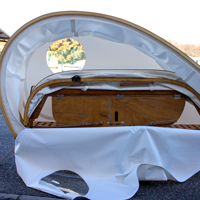 You can unzip the side panels so the wind blows right through or you can extend the Foldavan to Camping mode which will make it much more stable but the added wind resistance will make towing it harder. Q: How much does the Foldavan weigh? The Foldavan weighs from just 30 kilos including wheels and tow arm. In order to achieve this low weight it uses some special parts like carbon fibre tubes and quick release alloy wheels. The use of other materials may increase the weight. Q: I don't have any experience, can I still build a Foldavan? 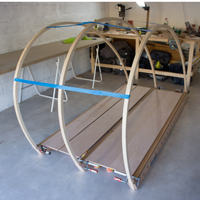 You do not need to have any special experience, you only need very basic woodworking skills, and a few tools such as a jigsaw and a plane to build the wooden structure but you may need help making the wheel and tow arm attachment. All this is covered in the plans and many alternatives are suggested. Q: Where can I get the materials? The Foldavan is a simple design that uses few materials in its construction. Most of the materials should be easy to find wherever you are and in varying quality to suit your budget. The plans include many links to help you find what you need. Q: What are the Foldavan's dimensions in 'Stow' mode? Q: What are the Foldavan's dimensions in 'Road' mode? Q: What are the Foldavan's dimensions in 'Camping' mode? The metric plans have about 100 pages and photos and even bonus sections full of useful information. The plans come as a PDF file and are about 8 mb in size. The Plans can be downloaded immediately from this site via PayPal. You do not need to have a PayPal account, and you can pay with your credit card. Upon completion of your payment you will be given an option to either save or open the plans. Save the plans to your hard drive. You will receive an email confirmation. From 30 kilos depending on spec.